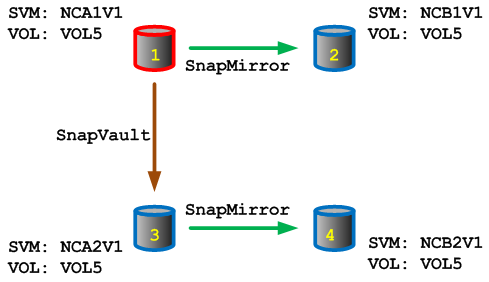 The title should really be: “Restoring a SnapVault Relationship in a DR Situation, where there was no relationship before.” That still probably doesn’t make much sense, so here are some diagrams. 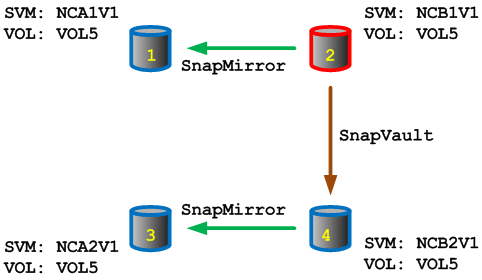 Using the lab constructed in this series; to simulate losing site A, we break the SnapMirrors - 1 to 2 (from 2) and 3 to 4 (from 4) in the diagram above - and then create the SnapVault (from 3 to 4) and make sure it’s working as a vault, whilst acquiring an understanding of the Snapshots (on 2 and 4) that are in play. Note 1: Highlighted in yellow are things I wanted to point out. Note 2: Highlighted in green are the action commands that would be run in a DR situation. Note: Since the previous policy was none, and the original source had the 10x10min_46x60min_2x24hrs Snapshot Policy, I’m pretty sure (and think I’ve tested this already) that all the historical Snapshot get managed correctly, and you can ignore the warning. Error: command failed: Relationship with destination NCB2V1:VOL5 already exists. Note: Since the _1900 snapshot has appeared we see the vault is already working!